Kashmiri cuisine is rich in protein and tastes great. My uncle spent some time there and learned some of the local delicacies prevalent in the northern part of Kashmir. 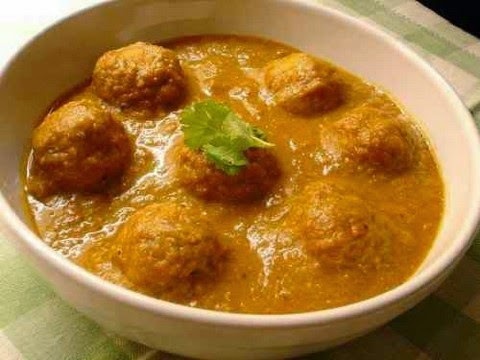 One such dish is local Kofta curry made from lamb meat that is often served in marriages and celebrations. It's extremely delicious and is rich in protein and minerals. You can also use beef or goat meat for this recipe, but the authentic recipe is always made from lamb meat. To get the authentic taste, make sure you use all the classic whole spices mentioned in the ingredients list. I prefer to serve this main course entry with fried rice or Indian flatbread. So let's see how to easily make this aromatic and mouth-watering Kashmiri recipe. Make this soft, unique and delicious Kashmiri kofta curry recipe that includes aromatic and pungent Indian spices and including a creamy and scrumptious curry. 1. Grind all the kofta ingredients in a mixer and make round meatballs by hand. 2. Make sure you put very less salt in kofta balls, as gravy will also have the salt. After making the balls, keep them aside. 3. Heat oil in a deep pan. 4. Add all the whole spices and stir for 2-3 minutes. Let them crackle and feel the aroma in the air. 5. Now's the time to add ginger-garlic paste. Bring flame to medium and saute for 3-4 minutes. 6. Add green cardamoms and all the powdered masalas. Saute for 2 minutes. 7. Add condensed and whipped curd and fry for about 3 minutes. Add little water, if required. 8. Add tomato puree and simmer for about 5 minutes covering the pan lid. 9. Add about 5 glasses of water and simmer for about 3-4 minutes. 10. Add cashew nut paste and salt to enhance the curry taste. 11. Now add the kofta meatballs and cook for about 25-30 minutes on low flame. Serving Tip: Kashmiri kofta curry goes well with naan as well as with fried rice.